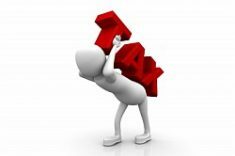 As a property owner, one of our obligations is to pay our real property taxes. 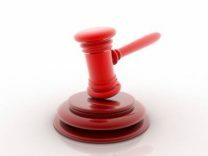 It’s a given, we really have no choice but to include it on our list of real estate expenses, unless we would want our properties to get included in tax delinquent property auctions. But did you know that you can get up to 20% off your real property taxes? Yes, it’s possible, and it is really quite simple… all you need to do is pay your real property taxes early! 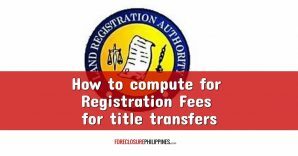 In Paranaque City for example, to avail of a 20% real property tax discount, you just have to pay in full on or before December 15, 2012, as per City Ordinance No. 04-22 series of 2004. By the way, sorry for the short notice folks! Anyway, if you can’t make the December 15 deadline for the 20% discount, you can still get up to 16% off if you pay on or before December 31, 2012. Checkout the tarp below which I saw at President’s Avenue in Paranaque City. 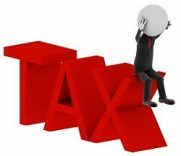 Just prepare yourself for any hitches you might encounter when you pay your real property taxes in Paranaque. I heard from a friend of mine that she tried to pay her property taxes recently but it turned out her property needed to be re-assessed. This resulted in a higher tax bill for her property… what a bummer! I believe other cities and municipalities also offer discounts for prompt and early payments of real property taxes. 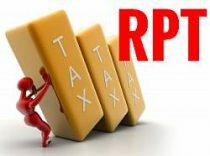 As mentioned in my post about the recently held tax delinquent property auction in Quezon City, residents can also get 20% off their real property tax bill if they pay in full on or before March 31, 2013. 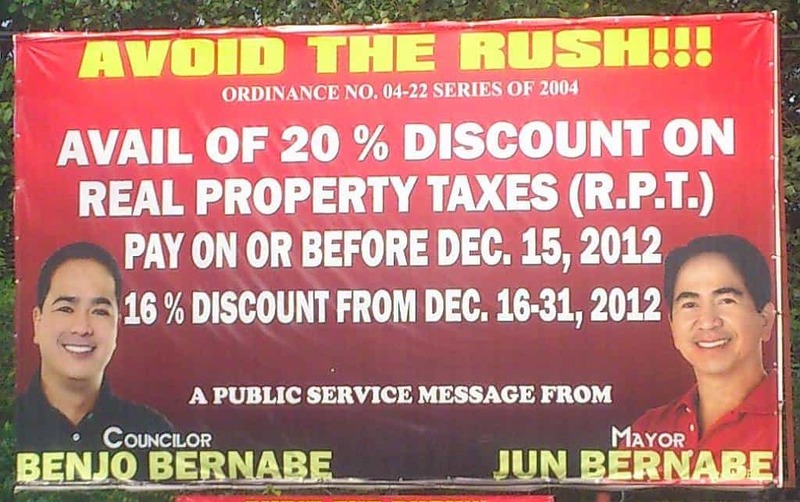 In Marikina City and Antipolo City, I know for a fact that they also give discounts if you pay in full for next year’s real property taxes, before the current year ends. So if you want a discount for your 2013 real property tax, all you need to do is pay in full on or before December 31, 2012… just make sure their offices are open when you do decide to pay. 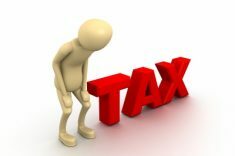 Have you already paid for your real property taxes for 2013? If so, how much discount did you get? Which city/municipality? Please let us know by leaving a comment below. Thanks! PS. 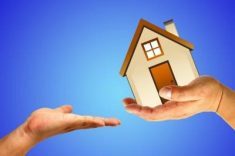 Don’t be the last to know, subscribe to e-mail alerts and get notified of new listings of bank foreclosed properties, public auction schedules, and real estate investing tips.